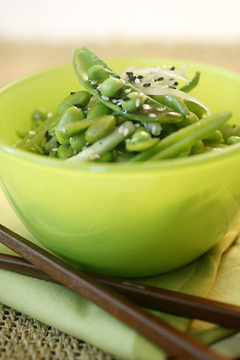 Edamame or fresh soybeans are packed with low-fat protein and vitamins. This salad is especially good during warm weather or served alongside a flaky piece of white fish. You can find frozen edamame in the freezer isle in organic and health food stores. Visit edamame.com to learn more about the incredibly nutritional soybean. Place edamame in a large colander and sprinkle with the salt. In a large bowl prepare the dressing by whisking the sesame oil, soy sauce, vinegar and mirin. Rinse the edamame under hot running water, until they are no longer frozen (about 1-2 minutes). Shake off the excess water and add to the bowl with the dressing. Stir in the sesame seeds, snow peas, green onions, and cucumbers. Serve immediately. Nutritional Stats Per Serving (1 cup): 147 calories. 9 g protein, 11 g carbohydrates, 7 g fat (0.9 g saturated), 0 mg cholesterol, 5 g fiber, 307 mg sodium.